The Basics of Two-Dimensional Art, often referred to as the Fundamentals or Foundations, can be defined as the "Elements and Principles of Composition"
Composition is the plan, placement or arrangement of the elements of art in a work. The general goal is to select and organize appropriate elements within the work in order to communicate ideas and feelings with the viewer. The artist determines what areas of focus of the art will be, and composes the work accordingly. The eyes of the viewer will then tend to linger over these points of focus. The illustration can be arranged in a harmonious whole that works together to produce a statement. 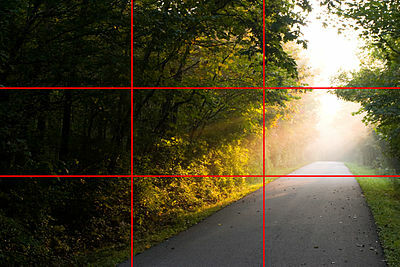 The rule of thirds (an application of the Golden ratio) is a guideline commonly followed by visual artists. The objective is to keep the subject(s) and areas of interest (such as the horizon) out of the center of the image, by placing them near one of the lines that would divide the image into three equal columns and rows, ideally near the intersection of those lines. Images with a clutter can distract from the main focus points within the picture and make it difficult to identify the subject. By decreasing the extraneous content, the viewer is more likely to focus on the primary objects. Clutter can also be reduced through the use of lighting, as the brighter areas of the image tend to draw the eye, as do lines and squares. Detail is used to develop a distinct focal point. One approach to achieving simplification within a photograph is to use a wide aperture when shooting to limit the depth of field. When used properly in the right setting, this technique can place everything that is not the subject of the photograph to be out of focus. By altering the position of the camera, the background can be changed so that the subject has fewer distractions to compete with. This could be achieved by getting closer, moving laterally, or moving the camera vertically. This is true in most common places and is the final test and the you must do this in order to pass the photographers law of photograpy. The "rule of odds" suggests that an odd number of subjects in an image is more interesting than an even number. Thus if you have more than one subject in your picture, the suggestion is to choose an arrangement with at least three subjects. An even number of subjects produces symmetries in the image, which can appear less natural. Related to the rule of odds is the observation that triangles are an aesthetically pleasing implied shape within an image. The position of the camera can strongly influence the aesthetics of an image. Not only does it influence the background as described above, but it also influences the viewer's interpretation of the subject. For example, if a boy is photographed from above, for example from the eye level of an adult, he is diminished in stature. A photograph taken at the child's level would treat him as an equal, and one taken from below could result in an impression of dominance. An image can be rendered more dramatic when it fills the frame. People can have a tendency to perceive things as larger than they actually are, and filling the frame fulfills this psychological mechanism. This can be used to eliminate distractions from the background. Every photograph contains lines. Both physical lines and continuous, less obvious lines exist. The brain often unconsciously reads near continuous lines between different elements and subjects at varying distances. Strong flowing lines can be created without a photographer even realizing it. Movement is also a source of line, blur can also create a reaction. Subject lines which create an illusion, contribute to both mood and by means of linear perspective give the illusion of depth of field. Oblique and angular lines give us the sense of dynamic balance and a sense of action. Lines can also direct attention towards the main subject of the photograph, or contribute to the photographs organization by dividing it into compartments. Horizontal, Vertical, and Angled lines all contribute to creating different moods of a photograph. The angle and the relationship to the size of the frame both work to determine the influence the line has on the image. They are also strongly influenced by tone, color, and repetition in relation to the rest of the photograph. Straight, horizontal lines, commonly found in landscape photography, gives the impression of calm, tranquility, and space. An image filled with strong vertical lines tends to have the impression of height, and grandeur. Tightly angled convergent lines give a dynamic, lively, and active effect to the image. Viewpoint is very important when dealing with lines in photography, because every different perspective elicits a different response to the photograph. Too many lines without a clear subject point suggest chaos in the image and may conflict with the mood the photographer is trying to evoke. Curved lines are generally used to create a sense of flow within a photograph. The eye generally scans these lines with ease and enjoyment as it follows it throughout the image. Compared to straight lines, curves provide a greater dynamic influence in a photograph. When paired with soft-directional lighting curved lines can give gradated shadows which usually results in a very harmonious line structure within the image. Perspective is also important with curved lines, generally speaking the higher the viewpoint the more open the lines tend to be. This page was last edited on 3 September 2013, at 19:08.